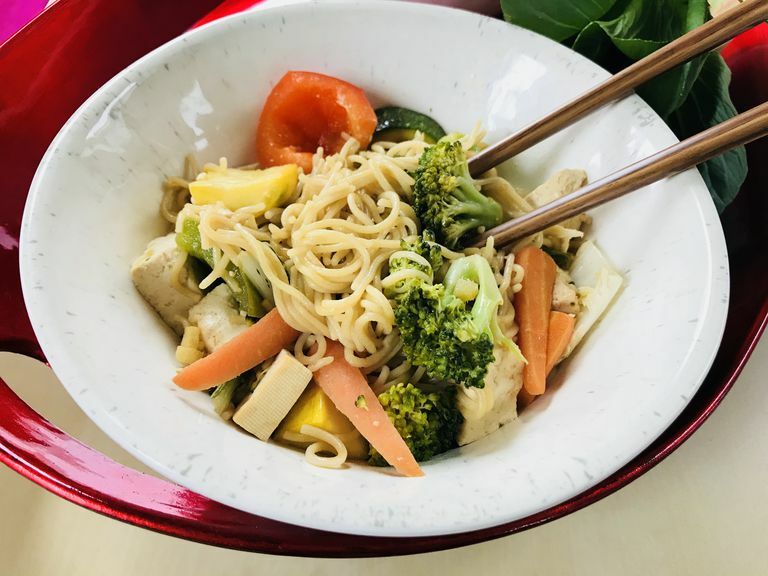 This take on classic Chinese Lo Mein is a lightened up version chock full of veggies, whole grain noodles, and plant protein. Brown rice and millet ramen noodles are tossed with a simple mix of veggies and drizzled with a delightful sweet-savory sauce. The flavors meld well and offer digestive benefits: there are some probiotics from the raw, unpasteurized apple cider vinegar and stomach soothing properties from the ginger. The variety of vegetables is also beneficial for your brain. Prepare the ramen noodles according to the directions on the package. In a small bowl, whisk together soy sauce, oil, agave nectar, vinegar, ginger, and Sriracha, if using. Add vegetables and tofu to a different large bowl. Pour sauce on top and toss until well-coated. Add vegetable and tofu mixture on the stovetop over medium-high heat in a large wok or skillet. Cover and heat for 10 minutes, stirring occasionally. When vegetables begin to soften, it's ready. Add noodles to the vegetable mixture and lightly toss. Remove from stove and serve while still warm. You can use whole grain spaghetti or linguine noodles. Add other vegetables, such as bok choy, scallions, eggplant, Brussels sprout, or cauliflower. For additional spiciness, add Chinese Five Spice or spicy curry powder for a kick as well as nourishing boost. Scramble the tofu before adding it to the vegetables for a different texture, if desired. Spoon the mixture into individual bowls and serve immediately. Sprinkle with sesame seeds, if desired. This dish cooks quickly so watch it carefully. Leftovers can be stored in an airtight container in the refrigerator to enjoy within two days.